Canne de combat is a French martial art closely affiliated with Savate. It uses a cane or canne (a thin walking-stick) designed for fighting. In the 1970’s Canne de combat was standardized for sporting competition by Maurice Sarry. The canne is very light, made of chestnut wood and slightly tapered. In competition a padded suit and a fencing mask are worn for protection. Targets are head, torso and calves. 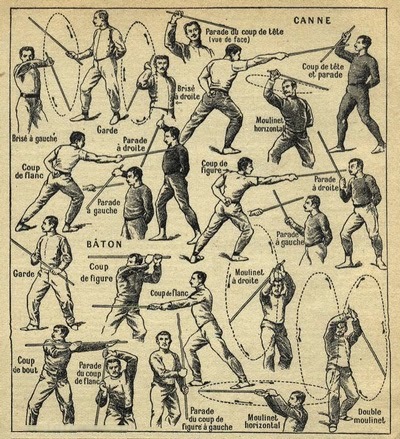 The use of the cane as a weapon, as originally taught in weapons schools, was codified by the Masters of Savate so that the cane was taught as a weapon of self-defence. It is quite rare, especially in the United States, and its use is being lost and today Canne de combat itself is disappearing. There is, however, a martial tradition passed down to the Swiss Master, Pierre Vigny in the 19th century which was used for codification of techniques using the Indian cane at the beginning of the 20th century, forming a separate tradition from the more common sporting cane seen in France today. The cane, first used for support and then as a gentleman’s accessory, also provided a useful weapon. A normal walking stick is usually within the boundaries of legal self-defence, but the loaded cane (weighted with lead at one end) may be considered a weapon in some legal systems. 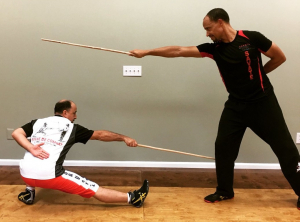 Professor Salem Assli has been visiting MKG Seattle for 10 years and sharing canne de combat with our community. This is part of the weekend with Professor Salem Assli. He is coming to to town for his annual Savate seminar. He will also be teaching a Maphilindo Silat workshop on Monday night, October 1st.